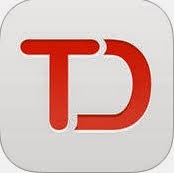 I have been experimenting with Todoist to help me manage my tasks for the day. I like that you can create your own projects and assign tasks to those projects. One of the things I would like to do with this project feature is to create a project that represents the breakthrough goal I am working on. I think Todoist will help me see what kind of progress I am making toward this goal, help me keep the goal front and center. I also like that you can collaborate on projects using Todoist. All people involved in the project must create an account. Once added to a project all people involved can add, assign, and modify tasks. Creating an account is free. Below is a short "How To" video.